When in May 1970, the Boeing B747 joined the Air France fleet, its “flagship” was the B707, capable of carrying 180 passengers over 9,200 km. In its original version (747-100), the “7 -4-7” offered the same range, but with a two or threefold capacity. This aircraft enabled Air France to adapt its long-haul flights to different customers. The first 747 – with its trademark hump just behind the cockpit – was first operated on the Paris-New York route, before being rolled out on all sectors. Seychelles, Mauritius, the Caribbean….faraway destinations were now not only accessible, but also affordable. In spite of the oil crisis, the impact was considerable – aviation had entered the era of mass transport. This was the era of the first tour operators and boom in charter flights. 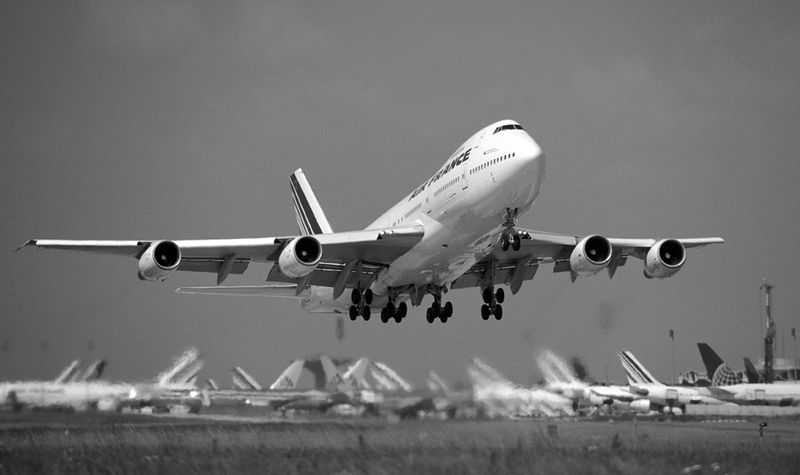 Airports were reorganized to handle the simultaneous arrival of several 747s. Flight crews rapidly familiarized themselves with this “big, easy to pilot, docile ship”, as described by Gérard Feldzer (who piloted the 747 for several years) in 2003. This was the cabin crews’ favourite, offering so much space in which to work. And in the cargo version, the nose lifted up to accommodate 100 t of cargo, which is impressive to see”. In all, Air France has operated 74 of these aircraft, in their different versions. In January 2016, the last of the 747s will connect Paris to Mexico for one last nostalgic flight. This will be its last flight, after 47 years of service; a record. After the war, Air France traffic increased dramatically. With a renewed fleet, it extended its network worldwide and hired with a vengeance.